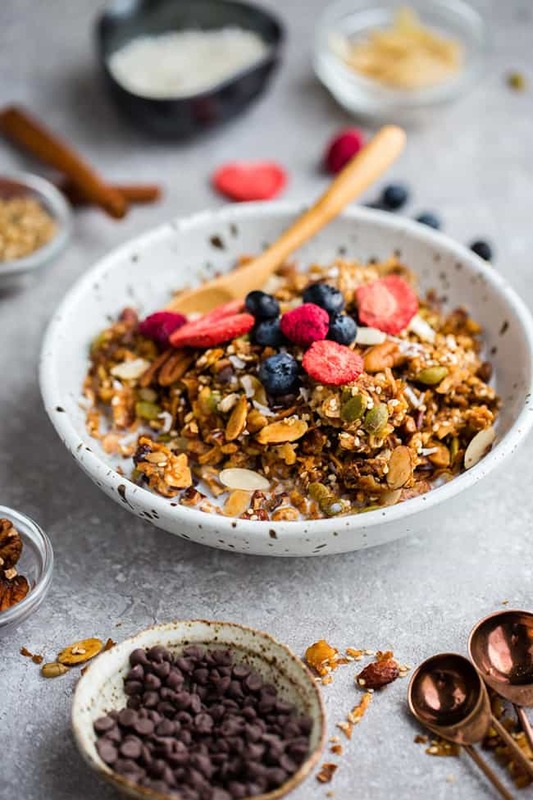 This tasty homemade granola is super simple to make with low carb, paleo and keto friendly ingredients. It’s full of crunchy clusters and makes the perfect sugar free breakfast or snack. 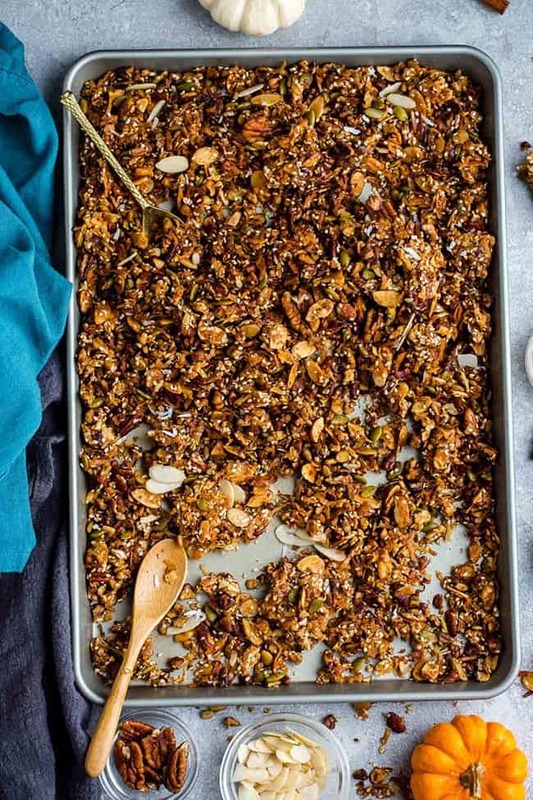 Homemade granola is one of our favorite snacks to make on the weekend. It all started years ago with this carrot cake granola and I love switching up the flavors to keep things fun. 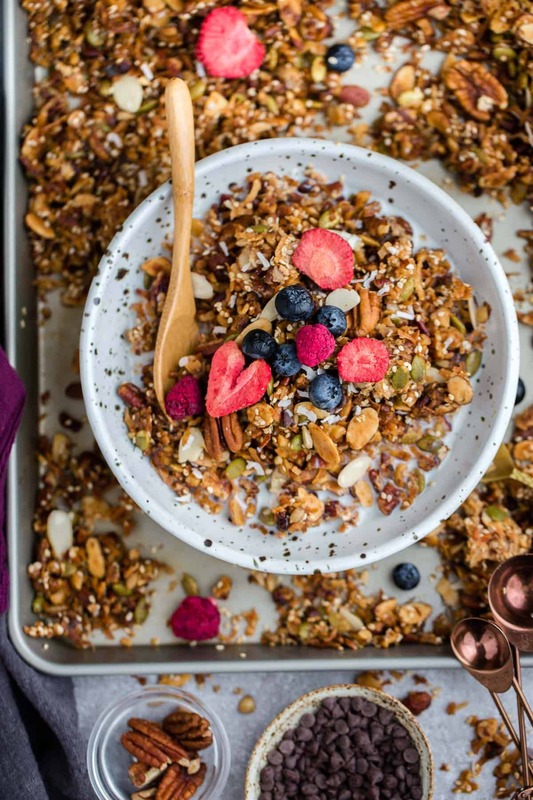 Most people think that making your own granola at home is hard, but it really couldn’t be easier. Homemade granola is the perfect snack for meal prep since you can bake up a big batch for the week. Then in the morning, just pour what you need into a bowl with your favorite toppings. Or if you’re in a rush, pack some up in a portable container for a simple grab-and-go breakfast. Another great thing about learning how to make your own homemade granola is that it’s a lot cheaper and healthier than most of the store-bought cereal. 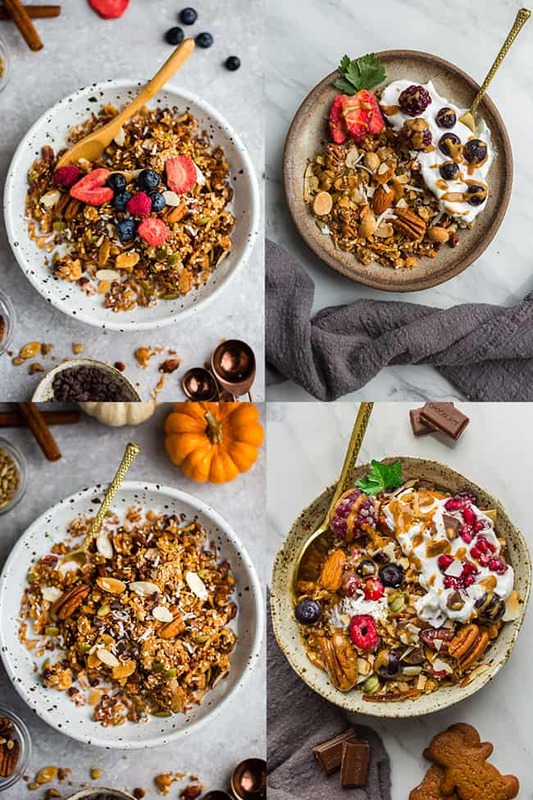 Boxed granola is usually much higher in sugar, carbs and packed with unnecessary ingredients and fillers. Now that I’m following a grain free diet, we’ve been making different variations of this Keto Granola. It’s full of big crunchy clusters and is low carb, paleo, gluten free, sugar free and made without any “real” oats. Plus it comes together quickly and is suitable if you are diabetic or following a grain free or ketogenic diet. This Keto Granola is delicious straight from the jar by the handful. And it’s equally delicious if you top it with some almond milk, coconut milk, coconut cream and a little bit of berries. And the best part? You can easily switch up the flavors of this low carb granola with whatever you like or have in your pantry. WHAT CAN I HAVE FOR BREAKFAST ON A KETO DIET? 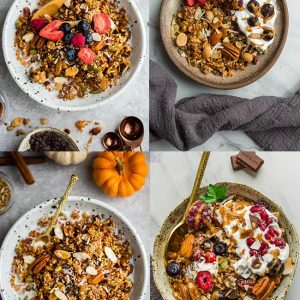 WHAT INGREDIENTS DO YOU NEED TO MAKE KETO GRANOLA? To begin, preheat your oven to 300 degrees F. Line a baking sheet with parchment paper. Set aside. 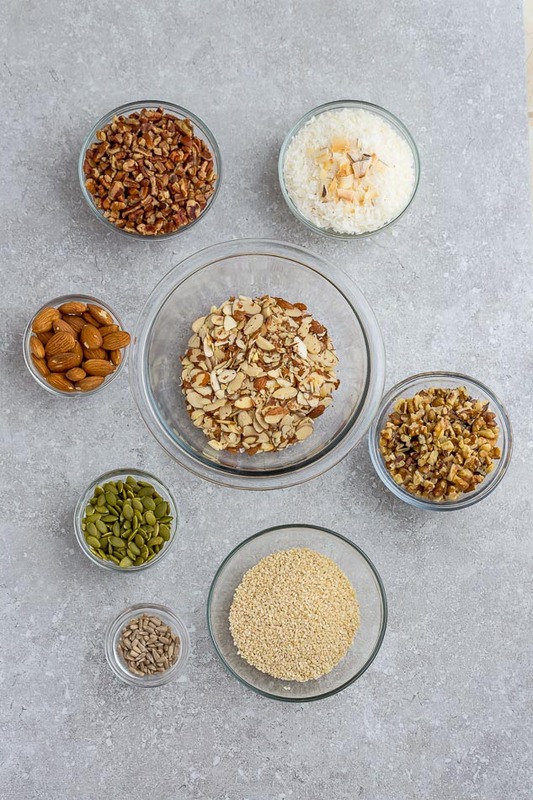 In a large bowl, combine all the nuts, seeds, coconut, sweetener, spices & salt. In a separate bowl, whisk together the melted coconut oil, egg white & vanilla extract. Pour over nut/seed/coconut mixture and stir until moistened & combined. Spread mixture in an even layer onto the prepared baking sheet and pat down flat with a spatula or your clean hands. Bake in preheated oven for 25 – 30 minutes or until golden brown, rotating the pan halfway through. (DO not stir granola while baking). Remove pan from oven and allow granola to cool completely. Once cool, break granola into clusters, & store in an airtight container. IS GRANOLA OKAY ON KETO? 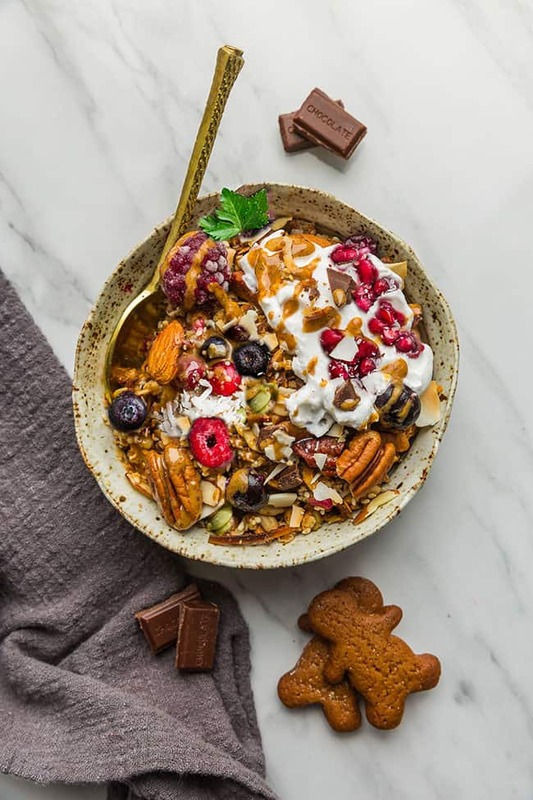 Most homemade granola is made with rolled or steel cut oats and full of typical high carb sweeteners like honey or granulated sugar so it usually doesn’t really fit into a keto diet. 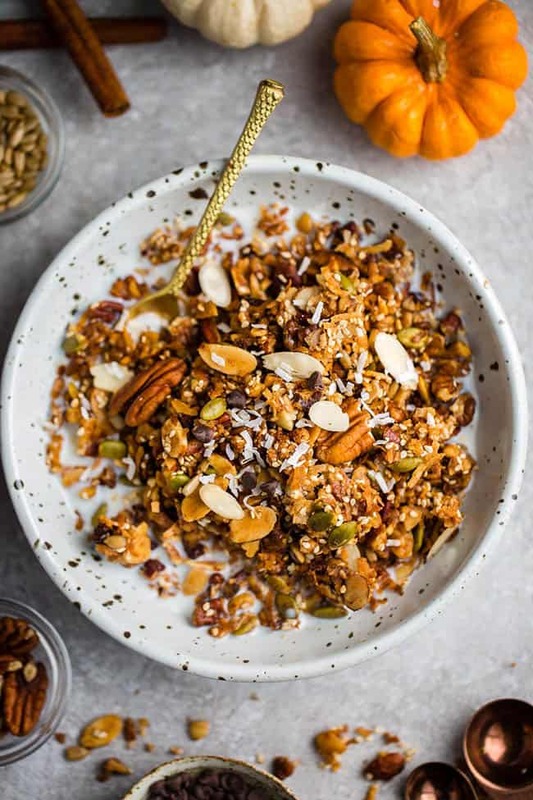 This low carb granola recipe is made without oats, so you can finally enjoy a bowl of crunchy grain free granola for breakfast or an afternoon snack when you’re craving it. Bonus points for being naturally gluten free, grain free and dairy free. I love that I can now make a quick and hearty bowl of paleo granola when that craving hits. 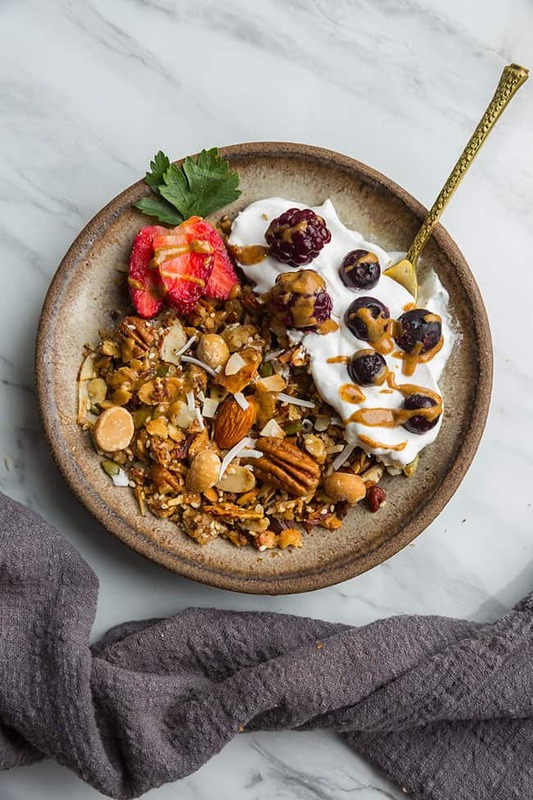 This tasty homemade granola is super simple to make with low carb, paleo and keto friendly ingredients. It's full of crunchy clusters and makes the perfect sugar free breakfast or snack. In a large bowl, combine all the nuts, seeds, coconut, sweetener, cinnamon & salt. In a separate bowl, whisk together the melted coconut oil, egg white & vanilla extract. Pour over nut/seed/coconut mixture and stir until moistened & combined. Spread mixture in an even layer onto the prepared baking sheet and pat down flat with a spatula or your clean hands. Bake in preheated oven for 25 - 30 minutes or until golden brown, rotating the pan halfway through. (DO not stir granola while baking). In a large bowl, combine all the nuts, seeds, coconut, sweetener, cinnamon, ginger, cloves nutmeg & salt. Remove pan from oven and allow granola to cool completely. Serve with toppings of your choice. In a large bowl, combine all the nuts, seeds, coconut, sweetener, cinnamon, ginger, cloves, allspice nutmeg & salt. In a separate bowl, whisk together the melted coconut oil, pumpkin puree, egg white & vanilla extract. Pour over nut/seed/coconut mixture and stir until moistened & combined. Spread mixture in an even layer onto the prepared baking sheet and pat down flat with a spatula or your clean hands.